Photograph of Paul Ereng. No date. In photo, Ereng is out front. Photograph by David L. Greene. Courtesy of the University of Virginia Athletic Department. 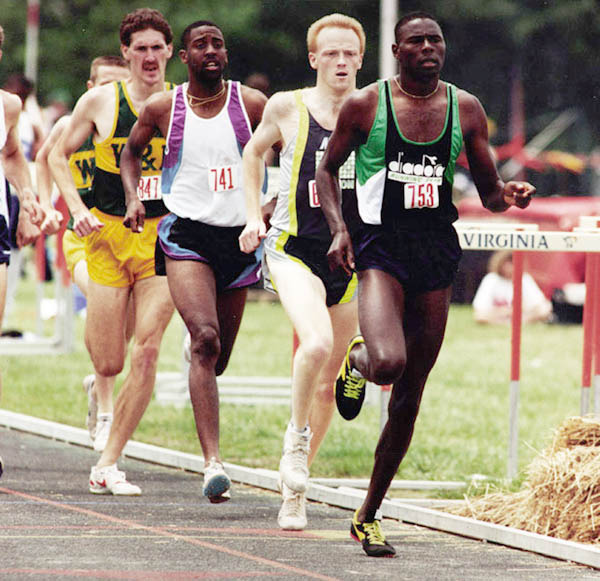 A transplant from Kitale, Kenya, first-year student Paul Ereng brought great pride to Virginia's track team and the University by capturing the gold medal for Kenya in the 800-meter race at the 1988 Summer Olympics in Seoul. This three-time ACC and NCAA champion and four-time all-American captured a world record in 1989 at the World Indoor Championship in Budapest of 1:44.84, breaking Sebastian Coe's six-year-old mark of 1:44.91. Internationally unsuccessful as a 400-meter runner, he switched to the 800-meter distance just a year prior to the Seoul Olympics.